Could the childhood game of I spy with my little eye help save the Great Barrier Reef? QUT is hosting its first Giving Day on 22 May, and it's your chance to help fund a citizen science project that will provide much-needed research to help save the Great Barrier Reef. QUT researchers are tapping into the power of what people see on the reef to create the first crowd sourced online interactive reef map, as part of the ‘Monitoring through Many Eyes’ project. The project has also been selected as the ABC’s online citizen science partner program for National Science Week 2018, providing an opportunity for all Australians to be involved. The project is developing a web platform, combined with state-of-the-art software and statistical modelling at the ‘back end’, to enable thousands of underwater images taken by divers each year to be uploaded and integrated with other types of data collected by professional monitoring programs, research institutes and private companies to create an interactive map that will increase the breadth of monitoring for reef health. “The sheer size of the reef is one of the greatest challenges because it’s difficult and expensive to monitor, which is what is needed in order to identify areas under threat,” said QUT Principal Research Fellow, Dr Erin Peterson. “Providing divers with the platform to geotag and upload their images, means we combine their visuals and knowledge with our data intelligence and modelling to provide managers and scientists with up-to-date information about the state of the reef. “It means people can provide information about reef health in easily accessible areas and professional monitoring teams can focus on remote areas, those closed to the public or those areas important for long-term monitoring,” Dr Peterson said. People can also explore virtual reef environments using phone technology and virtual reality (VR) headsets or classify coral within these virtual environments. 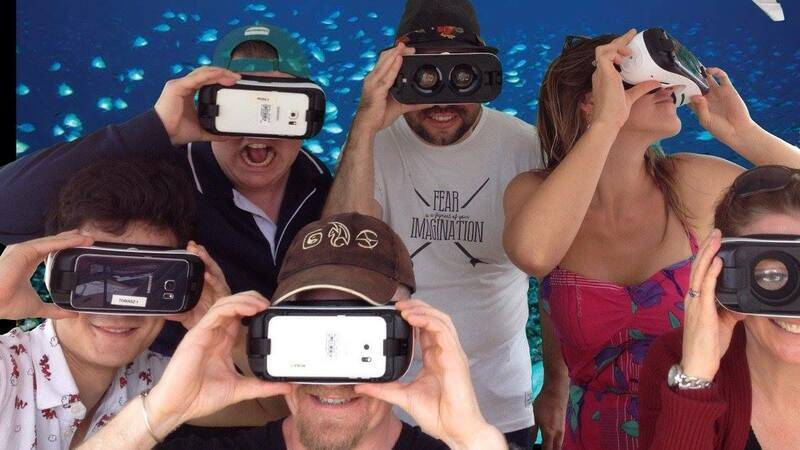 This allows people to explore the Great Barrier Reef and contribute to its management from anywhere in the world. “We know how important the reef is to people and we are providing everyone with a platform to help protect its uniqueness even without being there, by using VR to help classify images, providing expertise on coral health and learning more about the reef so they can advocate for its protection,” said Dr Peterson. “Through the involvement of thousands of citizen scientists coupled with technology and data intelligence, we will be able to create statistical models across time and space, to provide managers with the most up-to-date information based on every bit of data available. “This predictive modelling will provide a critical decision support system for planning, which means we can intervene more quickly in at-risk areas and help future proof the reef,” she said. The project has been proven in partnership with the Australian Research Council Centre for Excellence for Mathematical and Statistical Frontiers (ACEMS) and QUT is also partnering with the Australian Institute of Marine Science (AIMS) to undertake research to save the reef. AIMS Chief Executive Officer, Dr Paul Hardisty said they had been working closely with QUT to develop the next generation of technologies and management practices to help the world’s reefs adapt to a warming world. “QUT’s expertise, high calibre people and focus on developing solutions that have a positive impact in the real world make them an ideal research partner”. How do make we make it a reality? QUT is hosting its first Giving Day on May 22 to raise much-needed funds for research and education with a priority on saving the Great Barrier Reef. Dr Peterson said that with more than 77% of Australians aligning their identity with the reef, they are providing the opportunity for people to collectively protect what they value. The project recently received $20,000 to support it and are challenging citizen scientists to double the funding for Giving Day. “We are challenging 200 donors to collectively donate another $20,000 for Giving Day to bring the project to fruition and recognise the goodwill of citizen scientists to future proof the reef,” said Dr Peterson. Donate now by selecting 'Great Barrier Reef - Monitoring Through Many Eyes'. Researchers are using VR technology in a citizen science project to create a interactive online map of the Great Barrier Reef that will help monitor reef health.